Britain’s ignorance of Ireland is leading it blindly into crisis by Naomi O’Leary. Brexit has exposed profound ignorance, indifference, and retrograde beliefs towards Ireland in the United Kingdom. Conspiratorial tabloid pronouncements about Fine Gael courting Sinn Fein voters – an obvious absurdity to anyone familiar with Irish politics – leaked into Westminster chatter. Ian Duncan Smith jarringly pronounced that the election of an Irish president – a largely ceremonial head of state – could affect the policy of the government. There was the suggestion by Lord Kilclooney that the proudly Irish county of Donegal should join the United Kingdom to make the border more convenient. And there was the strange insistence by the Telegraph that the border between Ireland and the UK is “an entirely internal matter”. ‘Internal to what?’ Irish readers wondered, since our unhappy union ended in 1922, and the British Empire’s last claims to dominion were thrown off in the following decades. Swathes of the British elite appeared ignorant of much of Irish history and the country’s present reality. They seemed to have missed that Ireland’s economic dependence on exports to its neighbour came speedily to an end after both joined the European Economic Community in 1973. They seemed unacquainted with Ireland’s modern reality as a confident, wealthy, and internationally-oriented nation with overwhelming popular support for EU membership. Repeated descriptions of the border as a “surprise” obstacle to talks betrayed that Britain had apparently not listened, or had dismissed, the Irish government’s insistence in tandem with the rest of the EU since April that no Brexit deal could be agreed that would harden the border between Ireland and Northern Ireland. The British government failed to listen to Ireland throughout history, and it was failing to listen still. That many British people do not know basic facts about Ireland was not news to many Irish people. We commonly trade anecdotes about it. Some tell of their shock at discovering, on their first day of university or in a job in England, that their peers do not know that Ireland is an independent country, or that Northern Ireland is part of the UK. Others recall the puzzlement of British visitors to Dublin realising they need to change their Sterling into Euros. The story I tell is my realisation during the Brexit campaign that not only have the British public been failed by their education, but that this ignorance extends into the ranks of those upon whom the most prestigious educations in the world have been lavished. Privately schooled Oxbridge graduates who make their living in politics and who can chat confidently about the geopolitics of North Africa or Eastern Europe were not embarrassed to confess to me they knew nothing of Northern Ireland, and to ask me to remind them one more time which side was which. Now that Westminster has been forced, with much bafflement and resistance, to once again grapple with the frustrations of our little country as part of an international negotiation, the rest of Europe has had a glimpse of this ignorance too. Such ignorance is all the more puzzling since it indicates a low level of knowledge about the UK’s own borders and history. This is not an option that Ireland has: apart from the cultural familiarity that comes from having a larger country broadcasting media in the same language just next door, Irish politicians do not have a choice but to contend with Britain. Our knowledge of each other is lopsided. Unfortunately for Britain, not to know Irish history is not to know the Irish. History imbues Irish culture. It runs through our music, our jokes, and our literature. Our most popular sports, the Gaelic games, were born in their modern form in the 19th century cultural revival that fuelled our quest for independence. The border too is not just a geographical line, but a fissure that runs through Irish society. The spectrum of Irish political parties does not run right to left, but according to positions once taken on partition. 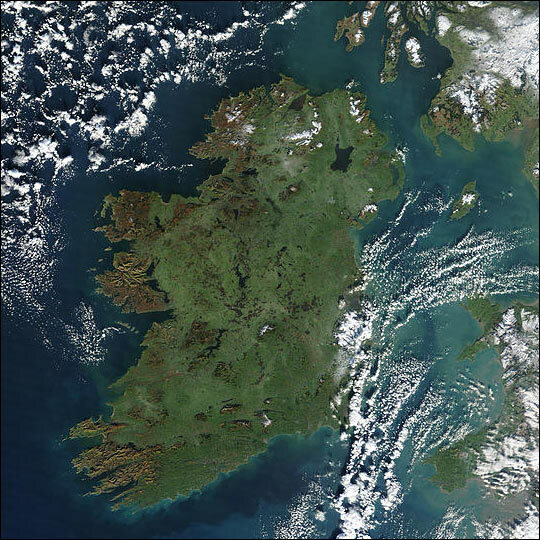 Fine Gael, the party of the Taoiseach Leo Varadkar, grew out of the faction that decided to stop fighting our War of Independence for a compromise: the partition of the country into 26 counties with self-rule, and six counties that would become Northern Ireland. Their rival large party, Fianna Fáil, is descended from the faction that refused to accept that deal, and carried on fighting in the name of a 32-county republic. The divisions of our parliament are inherited from the civil war fought between those two sides. Sinn Fein, the third-largest party, is of the faction that refused to put down arms against partition even later still. Imagine, in this context, reading the BBC’s Laura Kuenssberg article entertaining the idea that Ireland’s insistence on guaranteeing an open border to protect the peace was only a bluff. That we were only pretending to care. Such a thought can only be entertained in the absence of basic familiarity with Ireland. It displays ignorance that the preference of almost the entire Irish parliament is that the border shouldn’t exist at all, with disagreement only on how, and whether, that preference should be pursued. Imagine, in this context, reading the BBC’s Laura Kuenssberg article entertaining the idea that Ireland’s insistence on guaranteeing an open border to protect the peace was only a bluff. That we were only pretending to care. Such a thought can only be entertained in the absence of basic familiarity with Ireland. It has been obvious since before the Brexit vote that British absent-mindedness was headed for a collision course with reality. Northern Ireland was hardly mentioned during the campaign, and if so only with platitudes. Journalists from Northern Ireland have been sounding the alarm since before the referendum with increasing urgency, while ordinary people who live along the border wait unheeded to hear whether heir lives will be thrown into upheaval. I founded a podcast, The Irish Passport, to explain Irish history and its relevant to current affairs when it became clear that Britain was heading blindly into a border crisis. I investigated the English and Welsh history curriculum to compare it with what Irish school students learn. In Ireland, a far greater percentage of students learn history until the age of 15, and half of what they study is our national story: the long tale of British rule, resistance to it, independence and partition. In England and Wales, it is entirely possible even for those who study history to avoid learning about Ireland altogether. Our traumatic secession is strangely minimised, I discovered, though it meant the UK lost a large chunk of its landmass, and had to change its name. Here are the facts I have been urgently telling British people, so often they have almost become rote. That many people along the border don’t recognise it as legitimate. That people’s houses and farms are built on top of it. That people’s lives are lived straddling it. That Northern Ireland is in a delicate post-conflict situation, is the poorest part of the UK, and is set to be economically worst hit by Brexit. That paramilitaries are still active, still recruiting, and many would love a chance for glory. That a majority in Northern Ireland voted to remain in the EU. That the entire Brexit saga has been a long morality play demonstrating to those with qualms about Northern Ireland’s place in the UK that Britian knows little about the province, and cares less. I explain that the options are either to have an open border, or a deeply dysfunctional border that is probably violent and definitely a smugglers’ paradise. This border has about 300 crossings over its 300 miles. It is the deeply impractical result of political logic, designed in the 1920s in the interests of preserving a unionist majority within its confines. That in the worst years of the troubles, a fifth of the British Army’s manpower in Northern Ireland was dedicated to trying to police the border, and they were unable to do it. “Experience has shown that because of the length and nature of the Border, the Army, no matter how many men they deploy cannot ensure total security,” the Northern Ireland Office warned in 1974. My experience of making the podcast has been to discover that many ordinary British people are curious, open to learn, and embarrassed about how deeply their history education has failed them. Yet this sadly does not extend to many of their political representatives. They appear not only not to know, but not to wish to know. Two mass cultural moments happened in 2016 on opposite sides of the Irish Sea. In Ireland, we commemorated the centenary of 1916, the rebellion that is our founding myth. Archives were opened; street parades marched, films were commissioned, exhibitions opened, restorations launched, theatrical interpretations screened on national television. It was a mass open-air festival of history perhaps unrivalled anywhere in the world. It was coordinated by a Fine Gael government deeply uncomfortable with the legacy of pursuing political aims through force, and overseen by a culture minister of Ulster Presbyterian stock. Its emphasis was on exploring and embracing the pluralities, complexities, and diversity that Ireland has always contained. A copy of the proclamation of independence was given to every school: children were invited to examine whether Ireland had fulfilled its original radical, pluralistic promise of “cherishing all of the children of the nation equally”. Britain had a very different cultural moment in 2016. It was the year when the desire to stop immigration took over its politics and drove a referendum in which a mass of voters expressed their desire to close the borders, reject their neighbours, and embrace a harder, narrower understanding of what Britain means. He went on to refer to the “British Isles”, a term the Irish government doesn’t recognise. How a person so unequipped to deal with the common affairs of our nations could have held the position of Northern Ireland Secretary under David Cameron is indicative of the broader failure of political leadership in the United Kingdom that Brexit has left so exposed. Over the past two years, Brexiteers have repeatedly mistaken their own wishful thinking for reality. It’s a state of mind only made possible by ignoring of Ireland’s present and its past, and by ducking a broader reckoning with the legacy of the British Empire. Such ignorance is the luxury of a powerful nation, and one that Britain can no longer afford. Excellent article but I fear you are preaching to the converted. The British simply do not care, don’t know and don’t want to know, as you stated. Should a hard border be forced on the north they will soon be forced to confront their selfish, ignorant decisions when the ‘boys’ start blasting the ‘mainland’ again! I was 15 when the actual ‘troubles’ started in 1965 and so I can say that I hope with all my heart that it doesn’t come to that……. Interesting piece indeed. I follow Naomi on Twitter and seldom find her musings less than illuminating. I’m something of a student of history and know a bit about sixteenth-century Ireland in particular, but there’s always more to learn as an outsider (I’m Scottish). But it doesn’t surprise me to learn that many over here do not understand things from the perspective of Irish people since many don’t understand things from the perspective of people from different social classes etc even in their own country! I also see parallels with a poor understanding of Scotland’s history within Scotland itself, and again educators have some role in perpetuating this. I learned very little of Scotland’s past in the school system, finally finding out more about things like the reality of Darien and the 1707 union at university. But both in schools (and even in university actually) there was far too much focus on the World Wars. There is of course room for this – they are important historical events – but they are allowed to crowd out everything else because (one suspects) they present the idea of Britain in a good light. But we are all much the poorer for such a narrow historical focus. Aside from anything else, it’s just not as interesting as learning about lots of places and events, from lots of perspectives. And this allows people to yank our chain with a lot of lies about what other people’s motives for things are. More of this please Bella. An excellent article. Yet again the issue of ordinary people not educated in the fundamentals of recent history of these islands comes into sharp focus. The insular nature of a population who are educated via the media, and nothing more. There is no excuse to be made for the politicians. They are simply ignorant, pompous, disrespectful and uncaring of any damage that might result from the pursuit of a hard Brexit. I’m really glad to see Ireland has politicians with the cojones to assert themselves to protect their citizens and their 26 mates are backing them up. England are just sick that a former colony has the nerve to take back control. I am certain that those “Oxbridge graduates who make their living in politics and who can chat confidently about the geopolitics of North Africa or Eastern Europe” are quite as ignorant when they chat confidently about North Africa or Eastern Europe as they are when forced to query timorously about Ireland, it’s just that in the former case they aren’t embarrassed to admit it. I don’t think it is a particularly difficult problem to solve. The rEU will have only two land borders with the UK after 2019, and solutions for the Northern Ireland and the Gibralter borders will need to be identical. The solutions will include both parties agreeing a similar line on air and maritime controls and, depending on the desired degree of regulatory freedoms, some form of checking on freight movements. You seem to be saying Naomi that you have an aggressive belligerent neighbour who thinks that it can, due to its absolute economic and military superiority, run roughshod over little Ireland. Thing is, they thought exactly the same when they commenced wider exit negotiation with the EU. Not quite working to plan though as the economic growth stumbles, industry makes a bee line for the door, whilst the Brexiteers rumble the already impoverished biscuit tin for an exit payment which equals, or in fact exceeds the whole of a good year’s economic growth. Ah well it’ll all come good when we tell the USA and Mr Trump what we expect from them. Off to have my Sunday roast beef now and a rousing chorus of Rule Britannia. Ireland is bluffing since any use of the veto results in exactly what they do not want. The Common Travel Area will remain after Brexit along with the existing schemes at allow immigration checks at the Common Travel Area level. The UK & Ireland already share all passenger data. See 2011 UK-Ireland Accord. Pray tell he what evidence you have to say that Northern Ireland will be economically worst hit by Brexit? 8% of Northern Ireland total sales are to the EU (inc the Republic of Ireland) which is far less than most other parts of the UK. I agree with much that Naomi O’Leary writes, but not to mention Scotland once or the similarities between Scotland and Ireland when it comes to british indifference and ignorance is an unfortunate omission. There are many reasons for Scotland and Ireland to find common cause at this important time to fight a common threat, i.e. a colonialist british state that negatively impacts both our nations! Scots look on Ireland with envy, you have the birth right and capacity to mange your own affairs and make friends with whomever you wish. This is not the ignorance of Ireland O’Leary speaks of, it’s using Ireland as a benchmark of what could be for Scots when we throw off the colonial yoke of britain. Don’t commit the same mistake you criticise the british for by lumping Scots in blindly with the british. Perhaps a wee bit of research as to your audience before submitting your next article? As for brexit, no thought was given to the Irish border. The only border highlighted by westminster politicans, tory and labour in recent years, was that a border would be needed between Scotland and England should Scotland become independent. Trust and respect are critical for international relations, the uk was able to demonstrate this during the peace process and agreement in Northern Ireland. Trust and respect has dissipated with time as the security threat lessened. Hence you see second rate politicans like Patterson, Mogg and Smith making incendiary comments. The saddest side effect of brexit being to bind the tories and DUP together, a truely toxic combination. brexit is a mess, it will only get messier, Scots and Irish should unite to do whatever is possible to prevent it! The 2014 Scottish Independence Referendum took £16m of British taxpayers money to democratically establish that the majority of Scottish people (53.3%) wanted Scotland to remain part of the United Kingdom. It is a done deal. Vain attempts for another referendum by those disgruntled Nationalists unable to stomach the result, (akin to those who peddle the undemocratic notion that the United Kingdom parliament should overturn Brexit) is a denial of the very basis of our political system – the will of the people. You only need to use Google to see that smuggling across the border has nothing to do with Brexit. It is rife already due to different VAT, Tax & fuel duties rates. Uncomfortable truths Naomi for Brexitland. “Head in the sand & ignorance is bliss” should be the motto of the Brexit & Tory loons. The German`s had the grace and humility to face up to their past atrocities and take ownership of same, vowing to build a better nation and fairer society going forward in cooperation with their neighbours. Only then could the healing of the old wounds of the past take place. The Brits have yet to cross that Rubicon, mentally and emotionally they have been unable to face their history and its consequences head on, instead teaching themselves a sanitised and propagandised version of same that they themselves would only recognise, ignoring the uncomfortable truths. Unfortunately the same delusions are present in the north of Ireland today, perpetrating a perceived sense of superiority over the native indigenous Irish population and its culture in the six counties, and sustained by a introduced population that share the same historical delusion as their master`s in Britain. Hence the old wounds are still there and are easily opened by the deluge of ignorance and racism that has poured forth from the deluded right of British politics. All because an Irish government of a independent Irish State, has the temerity to stand up for the rights and concerns of its citizens and the hard won peace in Ireland. In the “good” old days of empire, the uppity MIcks would have been pitched-capped and hung, thankfully time has moved on and that option is not available to the Brexiteers. Now they have to face the reality of their situation and in the process maybe even learn some of their real history, but doubtful any humility. This is the best and most insightful piece on the island of Ireland and its place in the Brexit process that I have seen. Maybe the counties adjoining the border with the republic would be better leaving the UK, this would tidy matters considerably. You seem to think Brexit simply impacts on Ireland because of the border – this is an issue but there are trade issues that have potential to be devastating throughout Ireland because Britain is such a crucial market particularly for food industry. Also ‘cherishing all the children of the nation equally’ was aimed at Protestant population particularly in North the 1916 leaders wanted to guard against sectarian strife. Such would blemish the Republican cause they espoused. “Britain’s ignorance of Ireland” is a headline that angers me and makes you as guilty as “them” of stereotyping. I am a Scot and unfortunately also a Brit but not at all ignorant and angry that I am included in that headline. England is the ignorant party here. Be accurate. England is not synonymous with Britain. Frank, if you feel you have a handle on Irish history and politics, North and South, then the headline is not aimed at you. It is obvious from the article that the writer refers, in the main, to the political actors who are at the wheel of this car-crash but don’t even know where the wing mirrors are. It also speaks of the failing of the history curriculum. That you have surpassed this in a quest for greater understanding is to be commended, but, by dint of that effort, you must realise you are sadly in a minority in Great Britain. I have lived and worked in Ireland and I’ve been to Crossmaglen. I do know a bit more than average Brit about the border. I also know that the Commission is using the Irish border as leverage and pretending the issues and problems are much bigger than they actually need to be. The ignorance of the UK political elites and media of Ireland and its politics is lamentable and, in the current circumstances, deeply concerning. However, at the every day level the ignorance goes both ways. I remember when living in Dublin being introduced to a guy at a party and mentioning that I was from Edinburgh. “Is that anywhere near Glasgow?”, came the reply. While I entirely agree about the ignorance about Ireland which prevails in England almost the same could be said about their ignorance of Scotland. In English school history books almost the only mentions of Scotland are when they are invading us or when they ‘generously allowed us a few places in their parliament’, thus conveniently forgetting that the English Parliament also ceased to exist in 1707, to be replaced by what was to be the new UK Parliament. Likewise today the BBC and ITV give out almost exclusively English news so it is hardly surprising that the English know so little about the state to which they belong. It is a terrible shame indeed that we have in the UK arrived at this point in time, where the British people are just too stupid to be entrusted with participating in the democratic process. A great article – this is the kind of clear, accurate and educational material the ‘British’ mainstream media had a duty to get to the people prior to the EU referendum. They failed not only to do so – they didn’t even try. Niamh. Absolutely spot on! Thank you for writing this. Such an important article. My wife is from Northern Ireland – they were never taught about Irish history because it was “too political”. And that right there is the root of many of the problems. This is true…Belfast educated…however my English husband…Rochdale..was not given any English history apart from social …no kings queens battles etc…he says. I longed to know more of my countries history and had to read to find it for myself. Additionally, the statements that NI should have no special status different from the rest of UK ignore the fact that it is the only part of the UK whose constitutional arrangements are governed by an international treaty part of arrangements which recognise that another nation has certain rights and interests in that part of the UK and also commits the UK to facilitate the exit of that part should it ever be the democratic will of the majority. It has special status and for good historical and security reasons. There are also numerous issues nothing to do with customs and borders but to do with enshrined human rights. EU position no diminution of rights of Irish citizens ( of which there are a lot in NI, many NI born having sought Irish citizenship post-referendum). Rights are underpinned by EU law: equality and non-discrimination; citizenship rights; CTA rights; general principles of EU law and Fundamental rights, such as a right to an effective judicial remedy including a damages action against the State – a right being withdrawn by the Withdrawal Bill. Would reducing standards have led to reduction in citizens rights? The Inter-Governmental Agreement, which is part of the overall Belfast/Good Friday Agreement, included a commitment by both British and Irish governments to …protect “civil, political, social, economic and cultural rights in their respective jurisdictions”. If you are NI born you are already an Irish citizen as is anybody who was themselves born on the island of Ireland or one of their parents was born there. You only have to apply for Irish citizenship if one of your grandparents was born anywhere on the island. I’m sorry, you sound upset, it’s great you’ve got some passion to share your experience with people. And I too feel that pushing awareness is one if the first steps to bringing about change. For me I think the Uk should still leave the EU, my reasons differ from those you have outlined and for that I feel marginalised, which I probably don’t mind. I also feel the public should never have been given the power to choose to leave – but it’s done now. Culturally I identify as European, I want to love my neighbour and I want to be deeply integrated into the community in which I find myself. This is and I hope will always be my starting point before I entertain thoughts of national/internation politics. I would address the difficulties and tensions that I have the power to influence before trying to address things beyond my reach that I know less about. If we can do this as Europeans, then I can imagine a hope for the future. Thank you Naomi. Great article. I’m not sure which of the many statements made by the Brexit botchers is the funniest, but I’ve decided to go with Fine Gael dancing to Sinn Féin’s tune. It’s really good. However, when you belong not merely to a country but to a magnificence (like Britain), why would you bother to learn anything about anywhere else? Naomi, I wish you wouldn’t class the arrogant ignoramuses in the Westminster Village as ‘The British’. They don’t even know what is happening north of the Home Counties. History for us in Scotland was about the Battle of Hastings and the English civil wars. Scotland at that time had a kingdom and a long history of its own, independent of England. Trouble with the Anglo Saxon conquerors is that they feel it necessary to snuff out the history, language, customs and culture of all they colonise followed by the vilification of the peoples over which they have control. They even mangle the names of the towns and villages in France just across the channel. The trouble is that they still think you are a colony and will continue to insult you and your leaders. Their ignorance of Ireland and Irish affairs is now beginning to make them look absolute fools in Europe and the rest of the world. Alas, they are too thick skinned to even notice. Do any of us want to be part of this shambles? The Uk is not just Wales and England. Scotland is there to….so being Irish myself, and have lived in Scotland for over 25 years, perhaps I can draw your attention to a few anomalies as well. Every time I go home, people ask me, How’s England, and I politely point put, I don’t live in England, I live is Scotland. Sure, it’s all the same….that’s the next response, it’s not, thats like saying Cork and Dublin are the same, two counties fiercely proud of who they are, as to is Scotland. As you will know, but did not make clear, Scotland did not vote to leave, neither did N Ireland. The Welsh and English voted to take the UK out of Europe. England wants its freedom, its full of people like Nigel Farrage and Boris who harp on about Churchill and days of the Empire. If one thing is true, the UK is not united on this decision at all, but living in a collective of four countries, purely based on numbers of people, whatever England votes for, England gets, the rest of the UK don’t matter. So as much as I agree with your core message in your article, let’s as Irish people, educate ourselves better in the confusing, structure of the UK, because then you can report your facts more clearly, and if we as a nation are upset about England’s, not the UK’s perception of us, let’s at least be accurate in what we say. As someone who has made the study of history a lifelong hobby (including Irish), the statements made by Bella Caledonia surprise me not in the least. Neither does the British mass ignorance, so clearly demonstrated in the quotations above, come as anything new. I agree entirely that much of the stupidity displayed is partly the result of deliberate self-delusion by pro brexiters who are still in denial that the Referendum result was so close that no rational conclusion as to voters’ preferences could be drawn. Had Cameron been at all aware of the possible disastrous outcome he should have made a declaration of intention well in advance of the vote that no result of less than 60% either way would be acted upon. What a fool he was not to think it through, and what fools we are to persist in believing the Referendum result reflects the national will! I think that had the whole silly exercise been repeated a week later, the result could have reversed. It is not just Irish history which needs to be taught but 20th century European as well. The EU exists entirely to prevent the lessons of history from repeating themselves. I wouldn’t underestimate the potential for the insoluble border issue to have already been covertly resolved between the two governments, post Brexit, in close dialogue. A united Ireland is the end game, and only a matter of time. A transitional period, the will of the NI electorate is all that’s required. The legislation already exists. Do nut underestimate the implacable bigotry of the Unionist Irish. A united Ireland was the original proposal until Carson said no and UK backed down. The law of unintended consequences comes into play. If Westminster were to call a border poll, which is within their power, unity might be achieved but the consequences might be too terrible to contemplate. Hi Naomi, I posted this recently on another site, so your article struck a chord. Best wishes. “I was born in Ireland but spent 10 years at school in England. I received an excellent education in maths, science, languages and … HISTORY. BUT, it was all ENGLISH history, Ireland was rarely mentioned. Not the suppression of the Gaelic Order, little or no mention of Cromwell’s time here (but plenty about his activities at home, understandably), 1798, the Famine, the Easter Rising or the War of Independence. The main item they did mention was the Battle of the Boyne, not because of its relevance to Ireland, but because of it’s significance in the “Glorious Revolution”, which cemented the rule King Billy (i.e. William III). I had to go to the library and find some books on Irish history in order to educate myself. I don’t think the teaching of history in England has changed for the better, so that the current climate, where all kinds of smears are bandied about, however regrettable, is hardly surprising.” I should add, that there was a generally condescending attitude towards Ireland & Irish people, but that is hardly news. In 1964, when Mike Gibson & Ireland blew England away at Twickenham; I was jumping for joy. The rest of the room looked on in gloomy disapproval. I wouldn’t underestimate the potential for the insoluble border issue to have already been covertly resolved between the two governments post Brexit in close dialogue. A united Ireland is the end game, and only a matter of time. A transitional period, the will of the NI electorate is all that’s required. The legislation already exists. This piece is highly parochial. Being English we have a lot of history to cover in school. The tiny bit when Ireland split off and went Independent is just one little jigsaw piece. If you’re Irish then it’s a massive chunk of your national history and one that frames the next 100 years of your history and current affairs. Of course British children only have a vague grasp of Irish political history. It’s just not that big a deal to us. This border fuss making is Brussels using Dublin as their sock puppet. They don’t care about Ireland. They overturned your rejection of their treaty with arrogant contempt. In the banking crisis they flew their troika in and dictated exactly what your government could and could not do. The EU doesn’t wantbabhard Brexit and to lose its second biggest net contributor >15% of its funding and climbing. They don’t want debate in Britain in these pivotal months to be on german car imports or divorce bills – they want a narrative easier to grasp and to spin to joe public. The Irish border, the plight of those that live on it and the vague threat of a return to men in balaclavas bombing hotels is more useful to them. Hence a concocted fuss about a border. Sod all trade flows from NI to Ireland. Goods being shipped can be like 98% of all goods generally shipped internationally and customs cleared as they are boxed up in the factory. Smuggling can be minimised by having similar vat and duty rates in NI as in the Republic. If the British Army when it had 300,000 men could not patrol and police the border then it certainly won’t be done by them now with 70,000 men. Not by Ireland’s piddling forced or the EU’s non-existstant Army. So the border will be wide open. The WTO have no problem with that and have said so. You’re going to lose all that on March 30th 2019 if you use your veto and Britain only let’s you access it’s market on WTO terms and matches the EU tariff. And that’s just beef. Ireland will have a severe recession. Really severe. So go on then. Let Brussels sock puppet you over Brexit. The gun you’re pointing at Britain’s head has had the barrel welded shut by MI5 and if you pull the trigger it’s going to blow you’re hand off. And if the boys in balaclavas want to kick off in this post 911 post Isis world they’re going to find life a tad more complicated than it was 20 years ago. They’re old men and property developers now and half them were touting on the other half by the end anyway. It’s an empty threat. You’d be better off ensuring Brussels doesn’t balls up Brexit like it currently is. Hard Brexit that turns out a huge success will only serve to promote Irish exit from the EU. After all, the bulk of all your trade is in Sterling and Dollars, not Euros. And in the next crisis the French will have your 12.5% corporation tax rate by the balls. Goodbye Intel, Microsoft, Google, Apple…. And of course, the beef farms all went ages ago…. Is this why Ireland never really had a strong labour movement? Red pushed out in the orange and green. Why the corruption is so rife and justice is a joke? As an Englishman with Irish ancestry, I did feel that this article, whilst making some pertinent points, was a little bit sweeping in its generalisations. For many people, politics and history are not high up on their lists of interests, irrespective of where they come from, and the politics and history of a country other than their own will be even further down the list. It works both ways too, many Irish people are not too well versed in British history, other than where it affected Ireland. There are also many people in the UK who have a rather ‘romantic’ interpretation of Ireland and the Irish (particularly those with Irish roots), so it’s a complex picture. I agree about the politicians though, for there is no excuse there for the ignorance shown, it is their livelihood!